Gurkhas have joined British and French paratroopers as part of a major training exercise to improve their ability to operate together. A company of Gurkhas from Folkestone’s 2nd Battalion The Royal Gurkha Rifles joined more than 500 paratroopers from Colchester-based 16 Air Assault Brigade and 11e Brigade Parachutiste to launch air assault operations onto the STANTA training area in Norfolk. 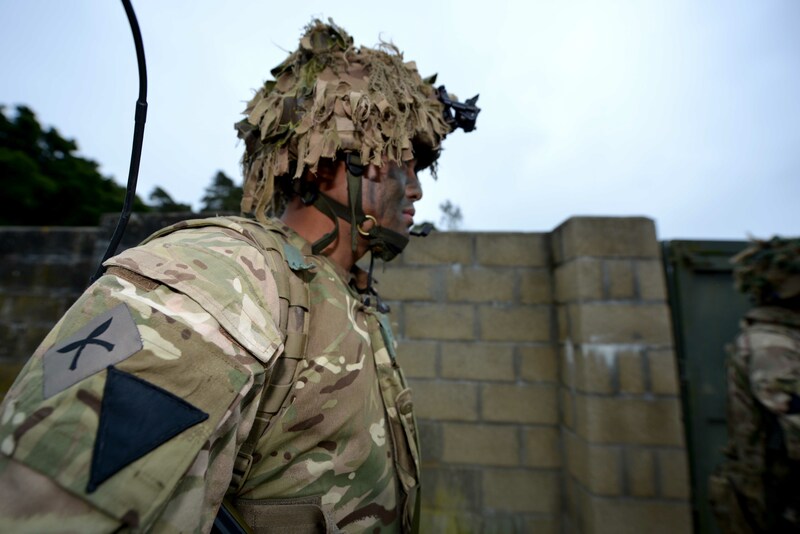 Exercise Eagles Amarante is an exercise challenging the joint force – built around 2nd Battalion The Parachute Regiment and 1er Regiment de Chasseurs Parachutistes (1RCP). The joint force was challenged with a simulated mission to restore stability to a troubled region. The Gurkhas worked as part of the 2 PARA Battlegroup, carrying out infantry assaults across the two-week exercise. The Gurkha soldiers used Britsh and French helicopters, while parachutists jumped from a RAF C130 Hercules and French Armee de l’Air C160 Transall transport aircraft to capture a foothold in hostile territory. Over the course of the exercise, extra troops and equipment arrived in the area to build up combat power, before the joint force attacked key enemy positions. The two-week long exercise started on Sunday 27 Sept, with 1,800 British and French troops and 300 vehicles and helicopters converging on Wattisham Flying Station in Suffolk to begin planning and organising missions. On Tuesday 29 Sept the paratroopers mounted their first operation, a helicopter raid on Rock Barracks in Woodbridge, followed up on Thursday 1 Oct with an aviation strike by Apache and Gazelle attack helicopters, from 4 Regiment Army Air Corps and Aviation Légère de l’Armée de Terre respectively. The training is designed to improve links between 16 Air Assault Brigade and 11e Brigade Parachutiste, which both provide their armies’ rapid reaction forces and are at the forefront of Franco-British military co-operation. Together they form the Interim Combined Joint Expeditionary Force (I-CJEF) which is ready to deploy at short notice on operations anywhere in the world. The partnership was validated in 2013, with Exercise Eagles Amarante part of an ongoing programme of joint training.